As they say on Broadway, the Fridge and Tunnel show has ‘gone dark’ these last few weeks. Turns out, at 29 weeks pregnant, I needed a vacation! But Mama’s back in Brooklyn and back in business. So I call this dish, Second Wind Linguine. A well-rested chef is a recipe for inspiration, or at the very least, motivation to cook at home again. I thought I’d focus on one stand-out ingredient and chose fresh Colossal Gulf shrimp. So colossal in fact that I halved them lengthwise (a great trick when you need the appearance of 1# of shrimp with a 1/2# budget. Just sharpen your knife first). 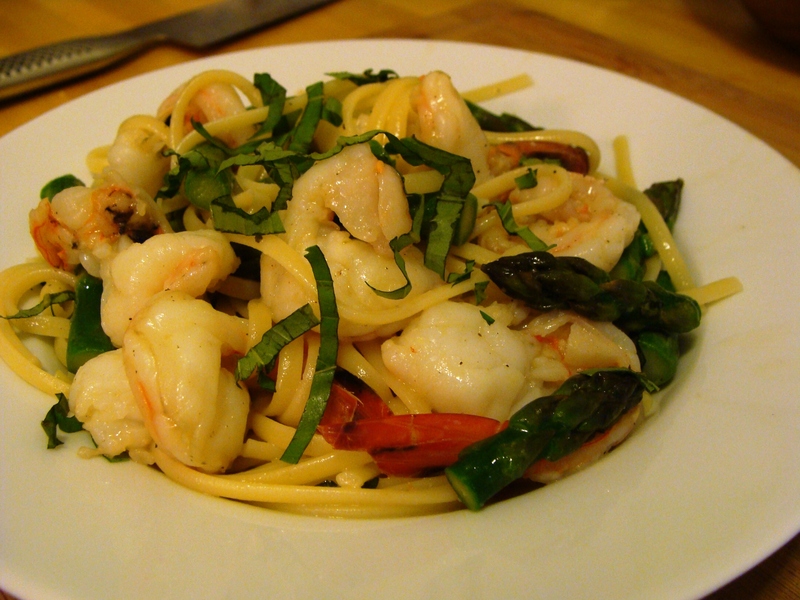 I saved the shrimp shells–don’t pay extra for shelled shrimp–and sauteed the shells in olive oil to begin my saute. This is a great tip for developing deep seafood flavor without the time commitment of making stock. 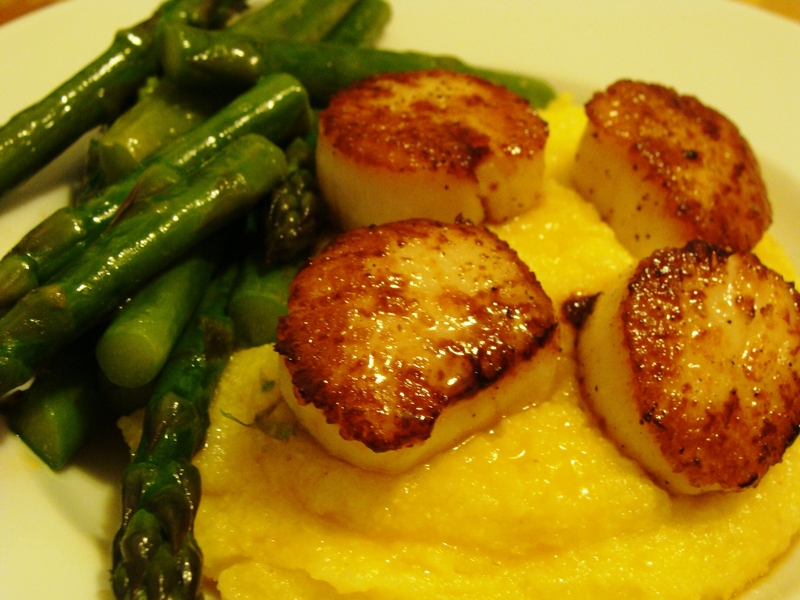 Simply remove the whole shells once they are crispy and you are left with a flavored olive oil. 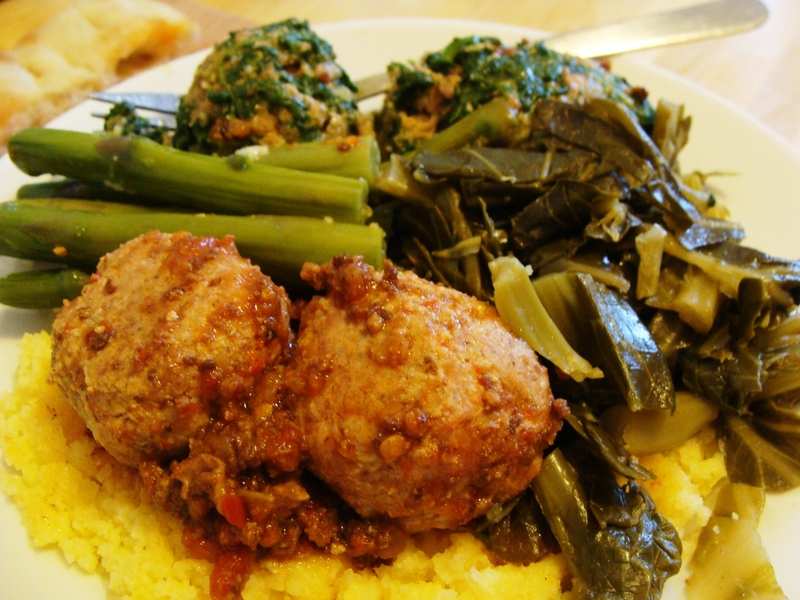 Working 2 pots at the same time, you will have dinner ready in about 15 minutes–enjoy! Bring a pot of salted water to boil for linguine. Meanwhile, heat olive oil in a large saute pan. Add shrimp shells and saute until crispy, 4-5 minutes; remove shells with tongs. Begin cooking pasta to al dente. Add garlic to saute pan and cook 2 minutes over medium-low heat, do not brown. Add asparagus and saute 30 seconds; season. Add wine and cover pan; cook 2 minutes. Uncover pan and add shrimp; cook until just curled and opaque, 1-2 minutes. Add butter and stir until melted into the pan juices. Remove from heat. Drain pasta and add to pan along with 3/4 of the basil. Toss with tongs to coat. Garnish with remaining basil.